Providence Hill Farm is a small family farm located in Atchison, Kansas. We breed purebred registered Nubian dairy goats for their high quality milk. We sell bread and milk from our farm, make farmstead cheeses, soap, lotions, and other bath and body products. We have a wood fired brick oven for fresh baked artisan breads. We also keep a flock of heritage type chickens for eggs. We sell limited amounts of naturally grown berries, fruit, herbs and produce when in season. At our Farmstead Artisan Cheese making workshops you will make cheese using traditional methods. 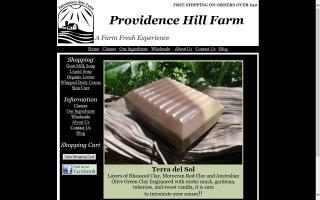 Join us for a soap making workshop, our classes offer everything you need to make natural handcrafted soap. We also offer Artisan bread making workshops where you will learn the art of creating beautiful rustic breads in a wood fired hearth oven.